The Band’s Visit wins Tony Award! Months after the opening of hit Broadway musical The Band's Visit, celebrated sound designer Kai Harada has won a prestigious Tony Award for Best Sound Design in a Musical, including fully object-based 3D sound courtesy of Astro Spatial Audio. 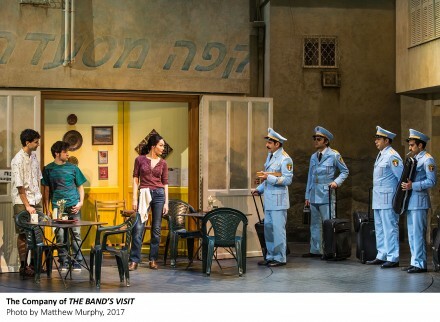 The critically acclaimed show, which opened in November 2017 to rave reviews at Broadway’s Barrymore Theater, tells the story of the Alexandria Ceremonial Police Orchestra’s arrival in Israel for the opening of an Arab Cultural Centre, only to find out that they have boarded the wrong bus to the wrong town – with some inevitably amusing consequences. Kai Harada is one of the world’s most respected sound designers, having previously been nominated for a Tony in 2012 for Follies. Astro Spatial Audio Managing Director, Bjorn van Munster, was quick to offer his congratulations: “We are delighted to have contributed to the success of The Band’s Visit, and now this prestigious Tony Award. Kai’s remarkable work on Broadway really deserves this recognition, and for Astro Spatial Audio this is another wonderful demonstration of how our object-based immersive audio solution can create truly innovative and inspired sound designs.